As this month begins, the Senior department at DCIS would like to extend a warm welcome this week to our new Head of Department, Mr John Smith, who will officially begin his time in Singapore from August 2015. Mr Smith will be joining us this week to meet staff, familiarise himself with the department and school, and to address parents on March 5th 6.00-7.30pm in the Cooper Hall on Options 2015-2016 and beyond. The Hilary term at DCIS has been an extremely busy one for Seniors. The CIP project, led by Mr Richard Lim to i-india at Easter, has required much preparation and planning. 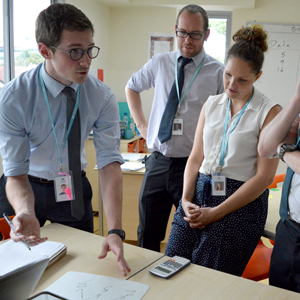 Students have met weekly for international briefings and awareness-raising workshops on the programme ahead of them. 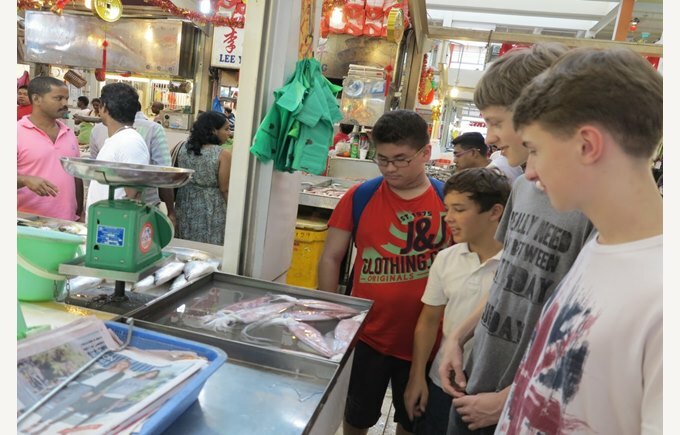 Mr Lim took students only yesterday for an experience of India by a visit to Little India with the group leaders who will be accompanying the students later this month. Strange tastes were enjoyed, the atmosphere and ambience of a busy Indian street was experienced as students jostled their way through the Sunday markets and arcades. The trip concluded with a vegetarian meal at a restaurant on Racecourse Road before weary, hot students made their way home. As one student remarked, ‘There’s not much air-con here’. The CIP project has already raised over $5,000 for the street children of Jaipur though its fund-raising activities during Charity week, which culminated in a pulsating, rhythmic evening in the Cooper Hall on February 13th for a pre-Valentine’s Day disco. Over 70 students danced the night away and we were delighted to welcome back former Dover Seniors who joined us for the event. This term has seen the launch of the Global Classroom. 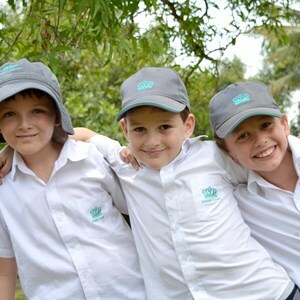 Ms Small and her team of Student Leaders has introduced students from Year 4 upwards to the exciting opportunities afforded them by the Nord Anglia Education Global Classroom, which aims to break down walls between students from all over the world in the Nord Anglia Education family. Projects that students have already been engaged with have been the Make it Right charity fund-raising and a Creative Writing Competition on the topic of Somewhere Unforgettable; prize-winning writers will have the opportunity to have their work published by Nord Anglia Education. Another project to come later this term has been announced to students only today: the Nord Anglia Education Open Mic Competition. This invites soloists, instrumentalists and/or groups to submit an entry for compilation on an award-winning CD; Ms Small looks forward to hearing from aspiring stars! In addition to our team of Prefects led by Mr Woodhall, who have continued to do a sterling job this term, we have appointed Student Leaders, as mentioned above, and another team of Senior students which is working with Ms Richards to become Senior Ambassadors. This will allow students across the Senior department to pursue a range of Leadership opportunities in varying capacities. The Prefects this term have launched a philosophical Thought for the Week opening address to our Senior assemblies on Mondays. Some Ambassadors are already greeting Infant and Junior students in the mornings and assisting them to their classrooms. This term we have welcomed new students into Year 7; they have embraced life in their new school community wholeheartedly and have already become an asset to the Year group. Year 8 students in English are reading to and writing books for Year 2 students and are finding that revisiting their favourite childhood stories such as The Gingerbread Man and The Gruffalo is a lot of fun. Year 8 are also involved in a video project with Mrs Rinaldi, but more of that to come! 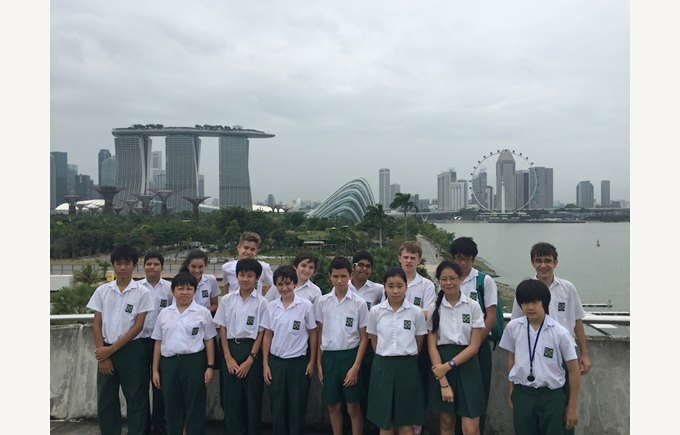 Year 9 have enjoyed a Geography trip to the Marina barrage and the super trees at Gardens by the Bay to link into a unit of work on Extreme Weather. 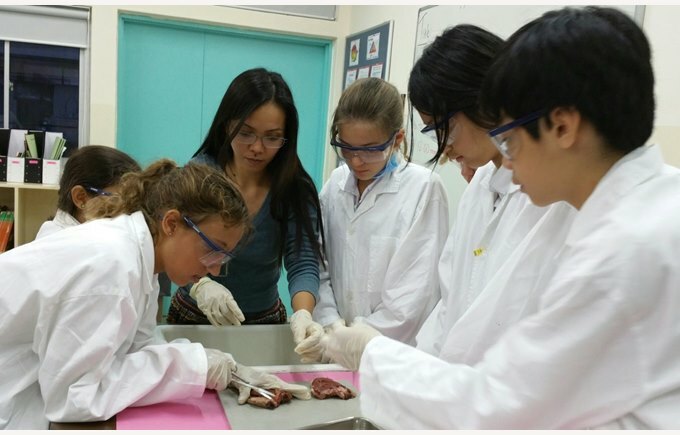 Senior students have been very practical in Science and have been enjoying this term working on a unit on dissection; rather them than me! Years 9 to 11 have also had the experience of mock IGCSEs, which was an arduous affair for some. Mrs Garcia our Examinations Officer and I have already reviewed the mock examination practice and a big ‘Thank you’ to all parents who submitted ideas and suggestions for future exam weeks; rest assured, your comments have been taken on board. The production of the Shakespearean Comedy Twelfth Night for Shakespeare Day 2015 is well underway. Mr McCarthy has taken over the directing of this production and all students are regularly engaged with rehearsals at lunchtimes. We will be in touch to notify parents of some twilight rehearsals later this term. Many students have taken on ambitious and challenging roles to avoid type-casting. Auditions for The Sound of Music are exciting and such a privilege to be a part of; each year I am in awe of the standard of our entrants. This year is especially magical as so many staff and students are ‘in love with’ the songs and major scenes before we have even begun our rehearsals! This retrospective overview of the Hilary term has been exciting but wait to hear what’s about to hit the Senior department! March 6th this Friday at 7pm in the Cooper Hall sees the start of more musical activity in the Senior department at DCIS with our Spring Soirée. 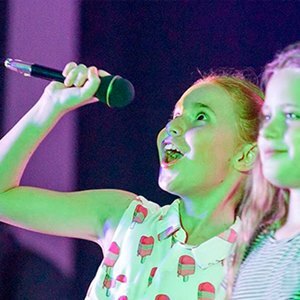 Senior students are involved, from the Prefect announcers and Front of House through to performers in both the School Choir and Orchestra, and as soloists. We have also prepared for you a hint of what’s to come in our School Musical Production next term. All parents and students are welcome to this event. The big news, however, this term for Seniors is the wonderful opportunity afforded to our ABRSM Grade 6 and above instrumentalists and singers across the school who have been provided with the opportunity to audition for the Nord Anglia Education Global Orchestra and be one of up to three students to be selected to attend the Juilliard Summer School, New York, in late June. Filming of the auditions will take place after the Soirée, if clips from the live performance are not available. The closing date for our submission is March 20th 2015. For other instruments, please enquire.